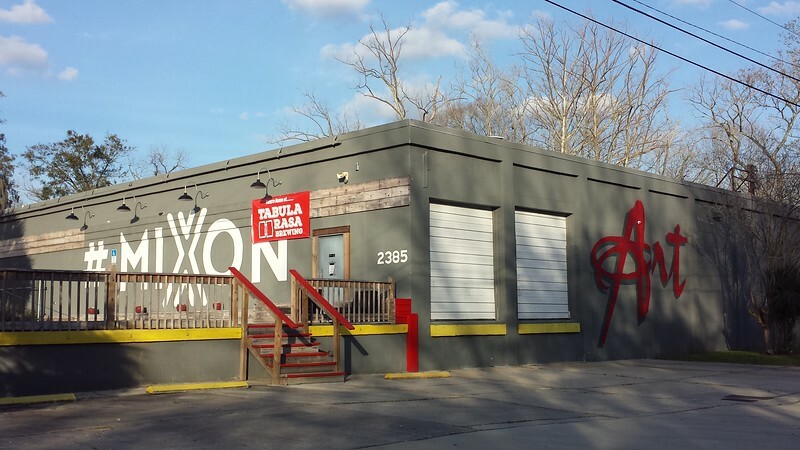 Craft brewery joining a creative community in Mixontown neighborhood. Ryan Peterson has submitted plans to open Tabula Rasa Brewing along the shoreline of McCoys Creek, joining Engine 15 Brewing in the resurgent Rail Yard District. Once described as the “biggest swamp in any city the size of Jacksonville in the world.”, McCoys Creek was known as a wild, meandering waterway with associated swamps that caused routine flooding in the rapidly growing city. That all changed in 1927 when city engineer Joseph E. Craig spearheaded the McCoys Creek Improvement project in 1928. The Walter J Bryson Company would receive $415,000 from the City of Jacksonville to create a 5 ft deep and 36 ft wide shipping channel for sport boating and barges to ship products and serve industrial users in the area. 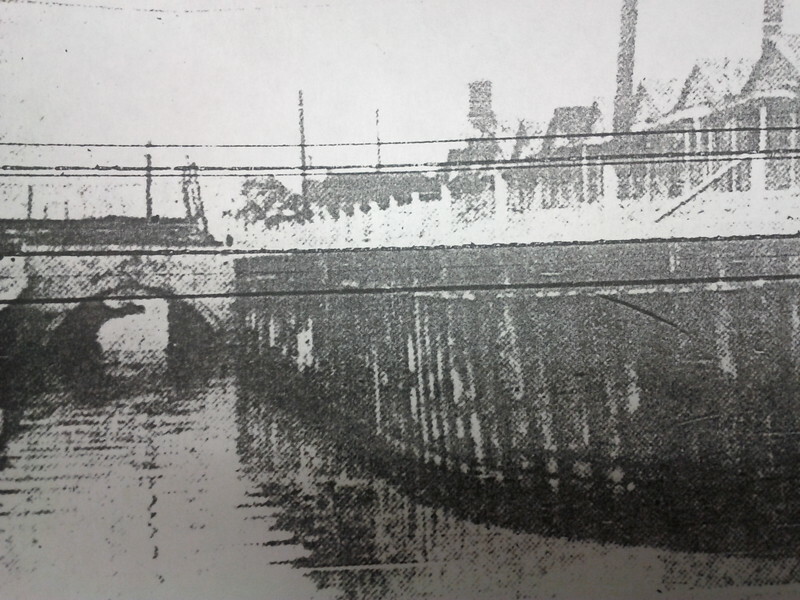 As a part of the project, new stayed-girder and reinforced concrete bridges at Edison, Fitzerald, King, Leland, Myrtle, and Stockton Streets replaced againg 19th century wood-frame bridges over the mendering creek. 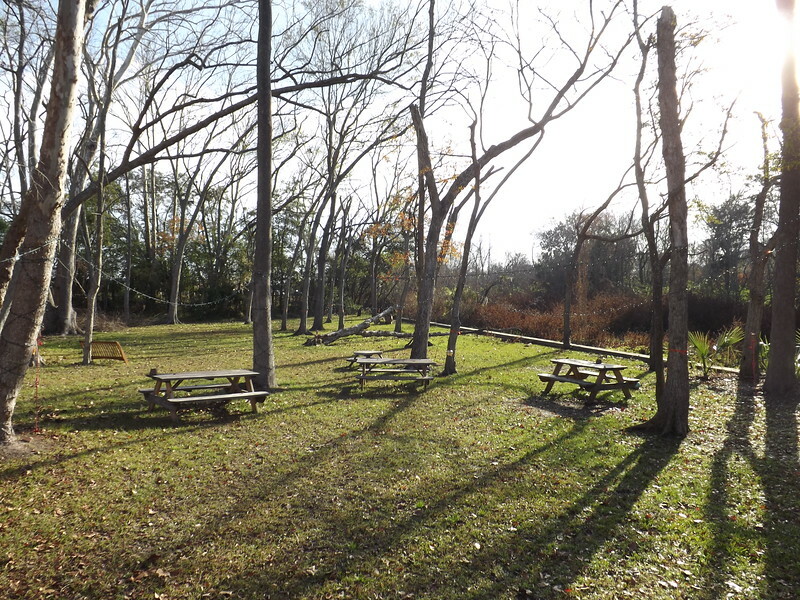 In addition, 29 acres of wetlands and former creek bed were filled to become a two-mile linear public park. Known as McCoys Park, the green space also included the construction of the two-mile McCoys Creek Boulevard. Furthermore, near the heavily developed St. Johns River waterfront, an 800’ long concrete culvert was constructed to reroute the channelized creek under the Jacksonville Traction Company car barn and the Atlantic Coast Line Railway’s terminal. Newly completed McCoys Creek bulkhead and Riverside Avenue culvert in 1930. By the time the McCoys Creek Improvement Project was completed on September 11, 1930, $610,000 had been spent by the City of Jacksonville to bulkhead the creek, construct seven bridges, and park. In addition, the Atlantic Coast Line Railroad contributed $50,000 for a new concrete railroad bridge crossing the new channel and McCoys Creek Boulevard. 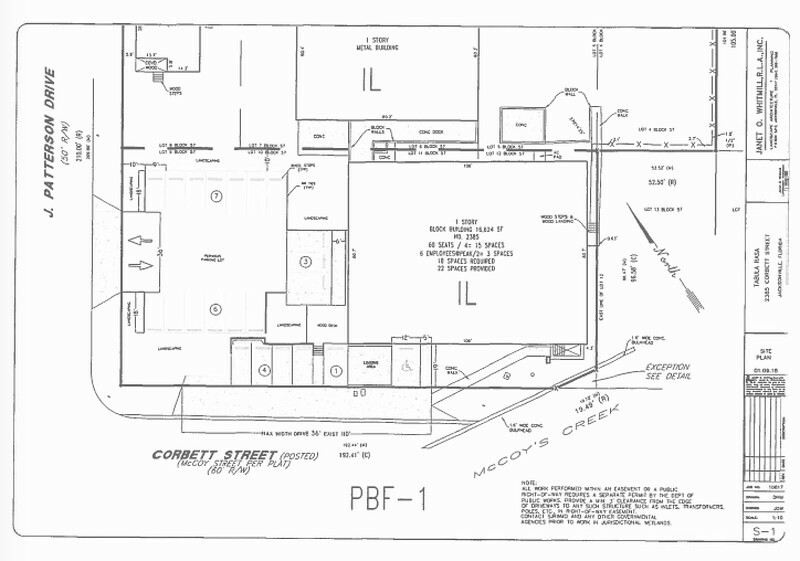 A look at the site plan for the proposed Tabula Rasa Brewing. The proposed brewery will be located at 2385 Corbett St, and will join a 1.6 acre, burgeoning community of creatives that already operate on site. The 16,600 square foot, multi-building industrial facility was built in 1952. The Excel Chemical Company operated an industrial detergent plant there from 1952 until 2015, processing industrial-strength floor waxes and degreasers. In 2015, Jeff Edelson was outgrowing his studio space in nearby CoRK Art Studios and was looking for buildings in the area. As fate would have it, Excel had recently lost its last client and was looking to unload an aging industrial property most would have viewed as worthless. Edelson purchased the building in May of 2015, and opened Mixon Studios - a makerspace, greenspace and event venue. The ethos of Mixon Studios is that of ‘a setting where quality, collaboration, innovation, communication, integrity and respect come together.’ Now, craft beer will be joining those guiding principles. This survey shows how many buildings make up the former Excel Chemical Company complex, now operated by Mixon Studios and soon to include Tabula Rasa Brewing. 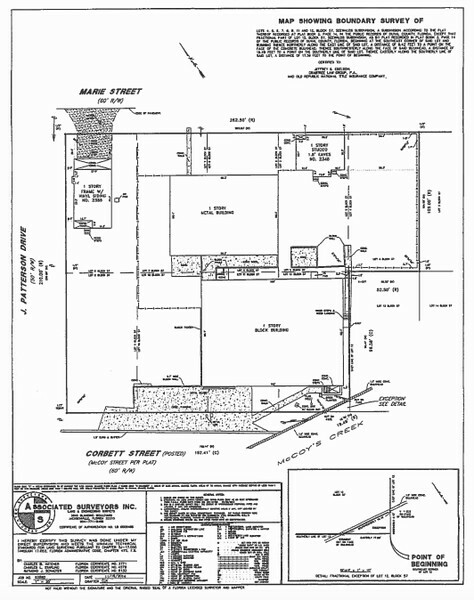 Although not as onerous as problems faced by recently opened microbreweries in Springfield, the rezoning application further illustrates how Jacksonville’s land use guidelines (particularly in struggling urban neighborhoods) do not encourage market-rate redevelopment of older buildings throughout the urban core. 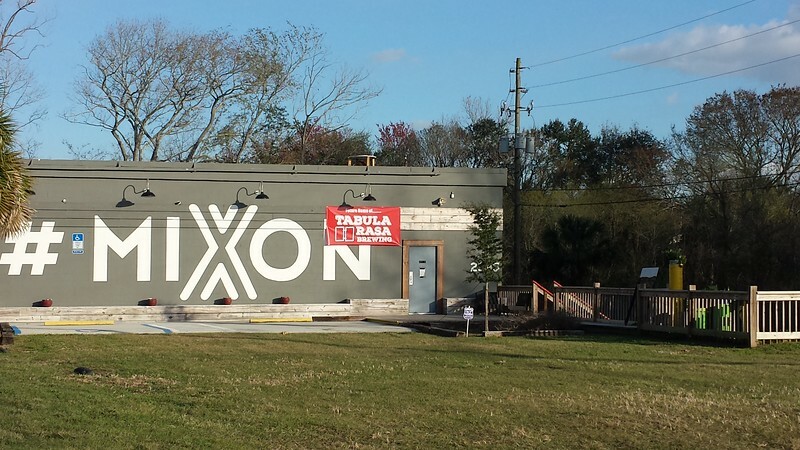 Despite craft beer’s positive impact on real esatate, microbreweries are not a by-right use in Jacksonville’s zoning code. Mixon Studios, these businesses and a host of others, are a part of a centralized wholesale district hidden in plain view that contributes hundreds of millions of dollars in local economic impact. It’s also an area where business owners are formally organizing in an effort to capitalize on the district’s assets and improve on infrastructure that has gone neglected for decades. Jeff Edelson’s studio is located in a 5,584-square-foot prefabricated warehouse, along with 14 other spaces for artist behind the main building. 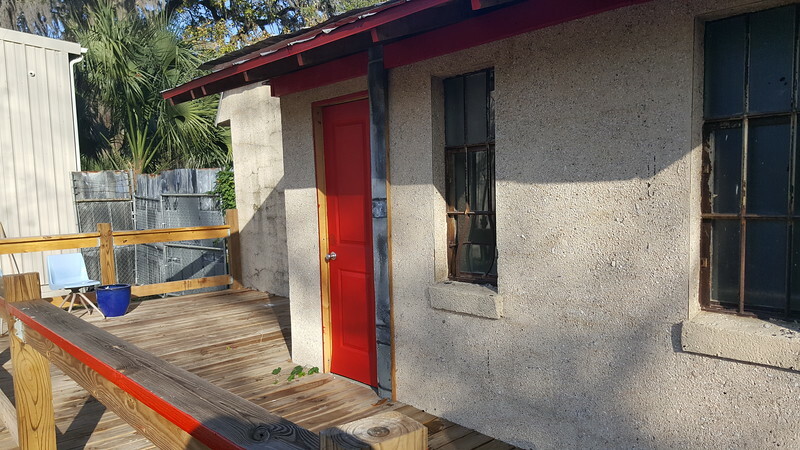 Next to it, there’s a 1,000-square-foot space known as the “Coquina” building. Dating back to 1952, it was a utility building that had not been touched in decades. Recently, it has been retrofitted and is now available for rent. Partially utilizing a former loading dock, an elevated wood deck connects these structures with what may be Mixon Studios’ most impressive space. Abutting the bulkhead of McCoys Creek, Mixon has morphed an adjacent unwanted, unmaintained and undeveloped industrial property into a concealed outdoor waterfront event space and sculpture garden in the heart of the city.